This workshop will focus on painting the spirit of creatures native to the Pacific Northwest. Animals teach us to hear and to see. Ruth will demonstrate how to go beyond painting fur and feathers, capturing the elusive and mysterious spirit of the animal and our relationship to it. Drawing from life and from reference photos, students will combine images to imply myth, metaphor and magic realism. 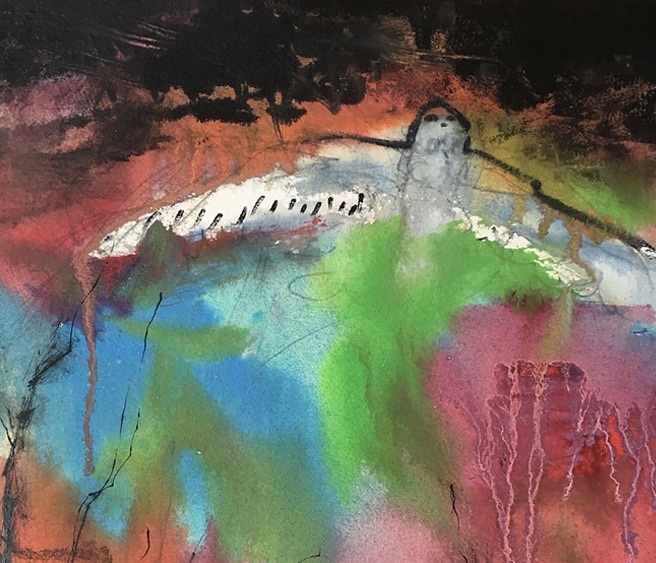 You'll explore secrets of color, line and texture used by master artists, experiment with collage and acrylic paint, and leave with symbolic paintings that express your connection to some of the elusive creatures encountered in this enchanting environment. Abstract painter Ruth Armitage has been honored with signature status in the National Watercolor Society and many regional groups. She divides her painting time between watercolor, acrylic and oils. Ruth's work has been featured on OPB's "Oregon Art Beat" and has been exhibited and published nationally. Recently, Ruth’s work was featured in the Spring 2017 issue of Acrylic Artist Magazine. You’ll find Ruth’s work locally at the Portland Art Museum's Rental Sales Gallery. A former high school teacher, Ruth enjoys sharing art and inspiration in the classroom. Students enjoy her organized and creative approach to teaching. copies... don't bring the originals. The best photos are the ones you take! • Brushes suitable for acrylic. At minimum, 1" flat synthetic or bristle, liner or rigger brush and #12 Round. Larger brushes are also handy. paper on, such as Gator foam, either 16x23" or 23x31"
• If you’d like to use Watercolor for this workshop. I would recommend adding white gouache and possibly white high flow acrylic by Golden to your mix, along with some caran d’ache watersoluable crayons. That should give you ultimate flexibility.